On-air challenge: Every answer is a word or name that has the accented syllable "no" somewhere inside it. Last week's challenge: This challenge came from listener Joe Krozel of Creve Coeur, Mo. Name a vehicle in two words, each with the same number of letters. Subtract a letter from each word, and the remaining letters in order will spell the first and last names of a famous writer. Who is it? Winner: Rob Olmstead of Clearwater, Fla. If you know the answer to next week's challenge, submit it here. Listeners who submit correct answers win a chance to play the on-air puzzle. Important: Include a phone number where we can reach you by Thursday, Feb. 7 at 3 p.m. ET. GARCIA-NAVARRO: So remind us of last week's challenge. SHORTZ: Yes. It came from listener Joe Krozel of Creve Coeur, Mo. I said name a vehicle in two words, each with the same number of letters. Subtract a letter from each word. And the remaining letters in order will spell the first and last names of a famous writer. Who is it? Well, the answer is army tank. Drop those letters, you get Amy Tan, who wrote "The Joy Luck Club" and lots of other books. GARCIA-NAVARRO: We received about 500 responses, and our winner this week is Rob Olmstead (ph) of Clearwater, Fla. Congratulations. ROB OLMSTEAD: Thank you. Glad to be here - I'm thrilled (laughter). GARCIA-NAVARRO: Yeah. How did you solve it? OLMSTEAD: Well, I kind of worked backwards. I tried to think of authors with three letters in their first and last name, and the only one that came to mind was Amy Tan. And it worked, so there I am. OLMSTEAD: I was living in the Huntsville, Ala., area and played it on the station up there and been doing it off and on since I moved to Clearwater - so about four years ago. GARCIA-NAVARRO: Wow. I hear you enjoy theater in your spare time and that you spent some time in Hollywood 20 years ago. OLMSTEAD: As they say, I won the lovely parting gifts. GARCIA-NAVARRO: I'm not going to do the Vanna White thing. I'm going to pass it on over to Will. Here we go. OLMSTEAD: Fair enough. All right. SHORTZ: Hi there, Rob. I'm afraid there's no money involved in this one either. 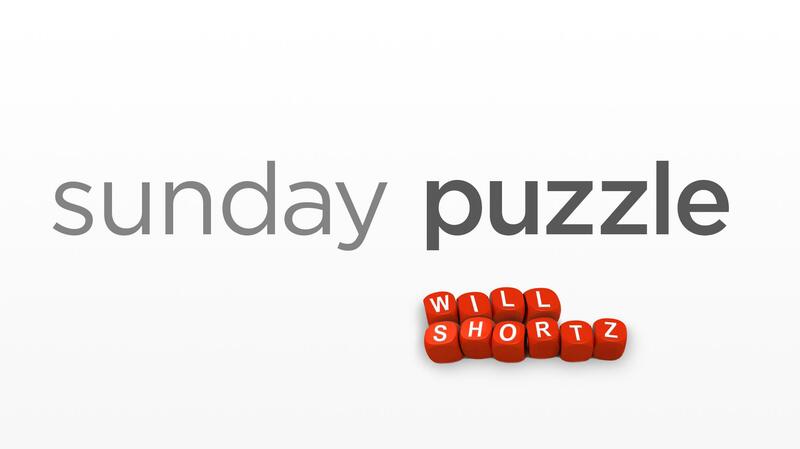 SHORTZ: So today's puzzle is called In The No. And that's spelled N-O. Every answer is a word or name that has the accented syllable no somewhere inside it. For example, if I said, kind of equation in mathematics, you might say, binomial or polynomial. Either one would work. Number one is children's character whose nose grows when he lies. SHORTZ: That's right. Number two - winemaking region of California. OLMSTEAD: Well, I'm thinking of Napa. SHORTZ: Right. It's the other big one - starts with an S.
SHORTZ: Sonoma is it. Trance-like state in which a person may be easily manipulated. And I might say, you are under my control. GARCIA-NAVARRO: Magicians do this, you know? They get people up onstage, and they make them do funny things. SHORTZ: Hypnosis is the state. There you go - site of a 1986 nuclear disaster in Ukraine. SHORTZ: Oh, hold that thought. It's in Ukraine. OLMSTEAD: Oh, (laughter) OK. Chernobyl. SHORTZ: A brilliantly exploding star. SHORTZ: Supernova is it. One of the longest rivers in South America. OLMSTEAD: South America. All I can think of is Amazon. SHORTZ: Yeah - starts with an O.
OLMSTEAD: I'm not getting that. SHORTZ: I'm going to have to tell you that one, I guess. It's the Orinoco. OLMSTEAD: Oh, my. Yes, you did have to tell me (laughter). SHORTZ: ...That hosted the 1968 Winter Olympics. SHORTZ: Now it's Grenoble. Right - Wisconsin city on Lake Michigan, where it's been very cold the last week. SHORTZ: Starts with a K.
SHORTZ: Kenosha is it - ladies' man. SHORTZ: Like a lover or ladies' man. OLMSTEAD: Oh, it's the guy's name. SHORTZ: That's it. Yep - starts with a C.
SHORTZ: That's it. And your last one - old name for Istanbul. OLMSTEAD: (Singing) Istanbul was Constantinople. OLMSTEAD: Had to think of the song. GARCIA-NAVARRO: Not on this part of the show. OLMSTEAD: ...To do the Super Bowl, but all right. GARCIA-NAVARRO: We've had this conversation with Will before. He is not a football fan. GARCIA-NAVARRO: For playing our puzzle today, you'll get a WEEKEND EDITION lapel pin as well as puzzle books and games. You can read all about it at npr.org/puzzle. And what member station do you listen to? OLMSTEAD: I listen to WUSF, 89.7 out of Tampa Bay area. GARCIA-NAVARRO: Wonderful. Rob Olmstead of Clearwater, Fla., thank you for playing The Puzzle. SHORTZ: Thanks for not asking me about the Super Bowl today. SHORTZ: This week's challenge comes from listener David Edelheit (ph) of Oyster Bay, N.Y. Think of a word meaning a particular body of water. Change one letter in it to get a new word meaning a particular body of land. What words are these? So, again, a word meaning a particular body of water - change one letter in it to get a new word meaning a particular body of land. What words are these? GARCIA-NAVARRO: When you have the answer, go to our website npr.org/puzzle and click on the Submit Your Answer link. Remember, just one entry per person, please. Our deadline for entries is Thursday, February 7 at 3 p.m. Eastern. Include a phone number where we can reach you at about that time. And if you're the winner, we'll give you a call. And you'll get to play on the air with the puzzle editor of The New York Times and WEEKEND EDITION's puzzlemaster, who does not like the Super Bowl, Will Shortz. Thanks so much, Will. (SOUNDBITE OF THE FOUR LADS SONG, "ISTANBUL (NOT CONSTANTINOPLE)") Transcript provided by NPR, Copyright NPR.